On Memorial Day weekend in Boulder City, residents, visitors and dignitaries gave of their time to remember and honor those in the military who died protecting the United States. Celia Shortt Goodyear/Boulder City Review The firing honor guard of Disabled American Veterans, Black Mountain Chapter 12, does a 21-gun salute at the Memorial Day ceremony Monday at the Southern Nevada Veterans Memorial Cemetery in Boulder City. Hali Bernstein Saylor/Boulder City Review Nearly 2,000 motorcyclists rode from Hoover Dam to the Southern Nevada Veterans Memorial Cemetery on Sunday to participate in a service to honor the nation's fallen soldiers. 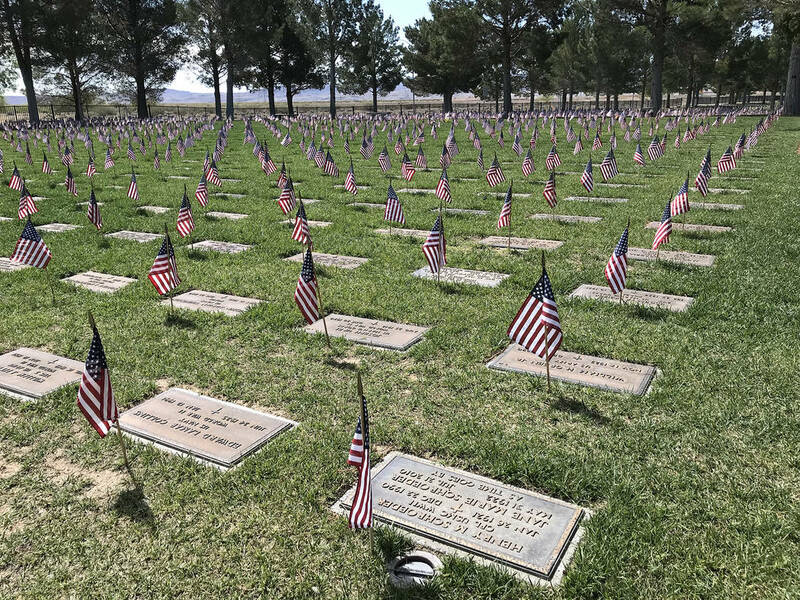 Hali Bernstein Saylor/Boulder City Review American flags were placed at each grave at the Southern Nevada Veterans Memorial Cemetery in Boulder City on Saturday to recognize their service for the long Memorial Day weekend. Celia Shortt Goodyear/Boulder City Review City Councilman Kiernan McManus delivers the keynote speech at the Memorial Day ceremony at Boulder City Cemetery on Monday. The program was hosted by American Legion, Post 31, in Boulder City. 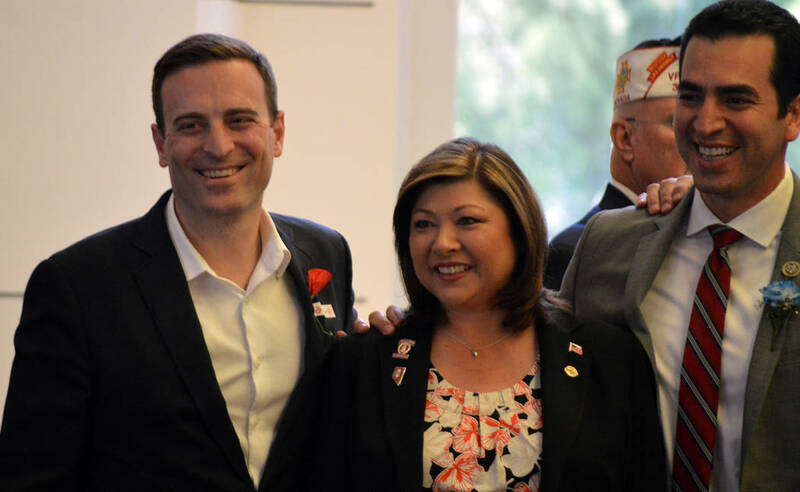 Celia Shortt Goodyear/Boulder City Review Nevada Attorney General Adam Laxalt, from left, Henderson Councilwoman Gerri Schroder, and U.S. Rep. Ruben Kihuen celebrate Memorial Day on Monday at the Southern Nevada Veterans Memorial Cemetery in Boulder City. 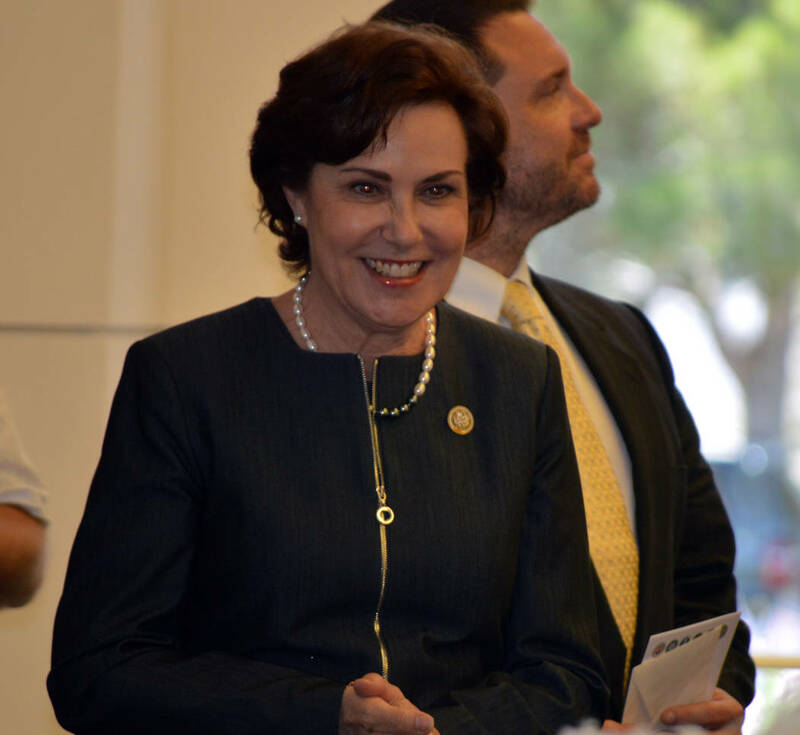 Celia Shortt Goodyear/Boulder City Review U.S. Rep. Jacky Rosen visits with constituents at the Memorial Day ceremony at the Southern Nevada Veterans Memorial Cemetery on Monday. Hali Bernstein Saylor/Boulder City Review Arrow, president of the Vietnam Vets Legacy Vets Motorcycle Club, addresses fellow riders and members of the Special Forces Association, Chapter 51, who came to the Southern Nevada Veterans Memorial Cemetery on Sunday to participate in a service to honor the nation's fallen soldiers. 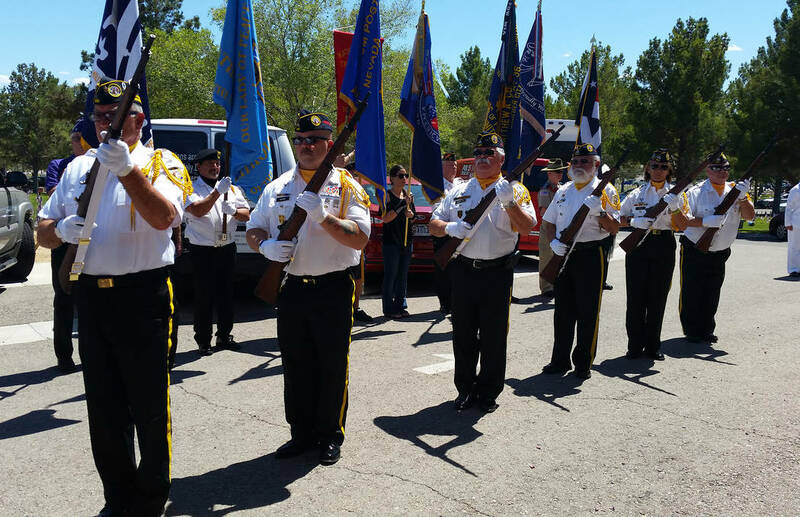 The service culminated the annual Fly Your Flags Over Hoover Dam motorcycle run. 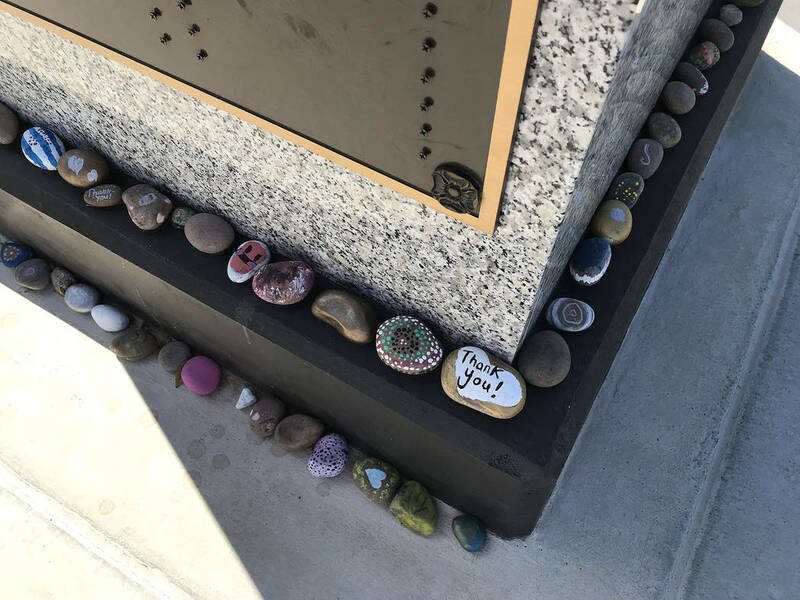 Hali Bernstein Saylor/Boulder City Review Painted rocks with messages of appreciation for our nation's veterans are seen on Sunday at the base of a memorial at the Southern Nevada Veterans Memorial Cemetery in Boulder City. Celia Shortt Goodyear/Boulder City Review U.S. Sen. Dean Heller jokes with a fellow attendee at the Memorial Day ceremony on Monday at the Southern Nevada Veterans Memorial Cemetery in Boulder City. Celia Shortt Goodyear/Boulder City Review U.S. Navy Lt. Cmdr. 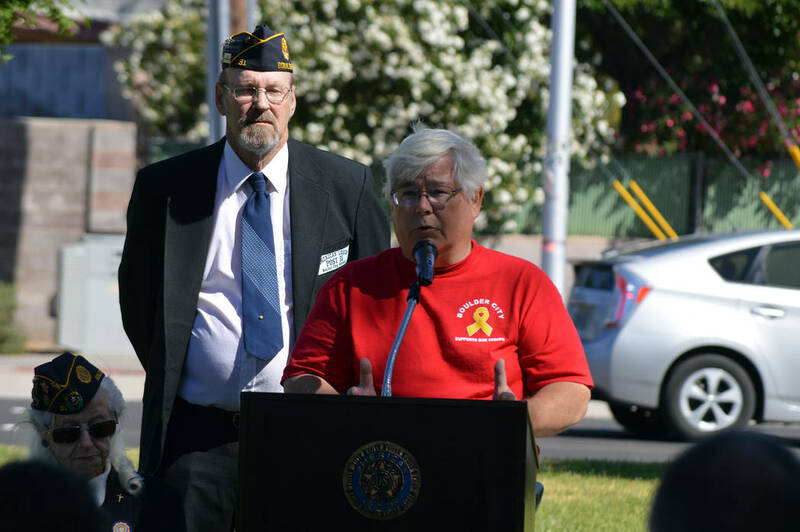 Ed Giron delivers the keynote speech at the Memorial Day ceremony Monday at the Southern Nevada Veterans Memorial Cemetery in Boulder City. 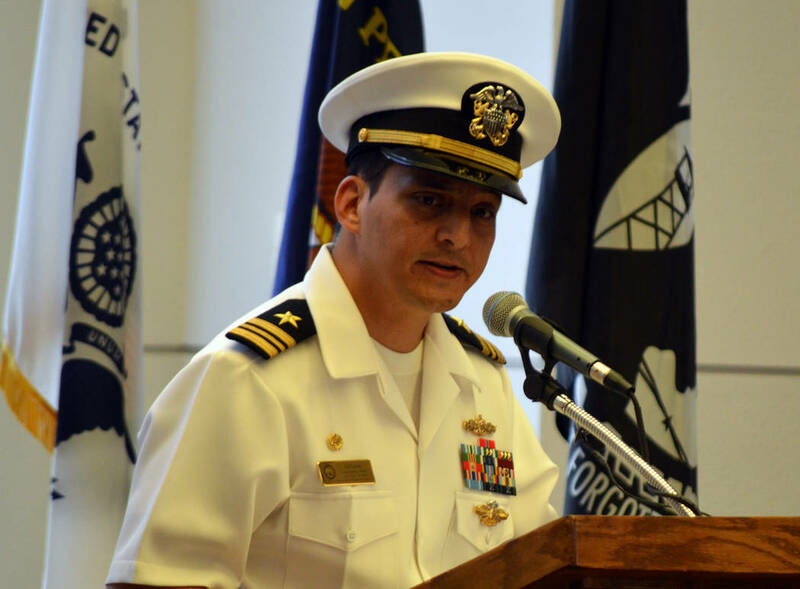 Giron is the commander of the Naval Operation Support Center in Las Vegas. The ceremonies began with a thunderous start as between 1,500 and 2,000 motorcyclists rode from Hoover Dam to the Southern Nevada Veterans Memorial Cemetery on Sunday morning. 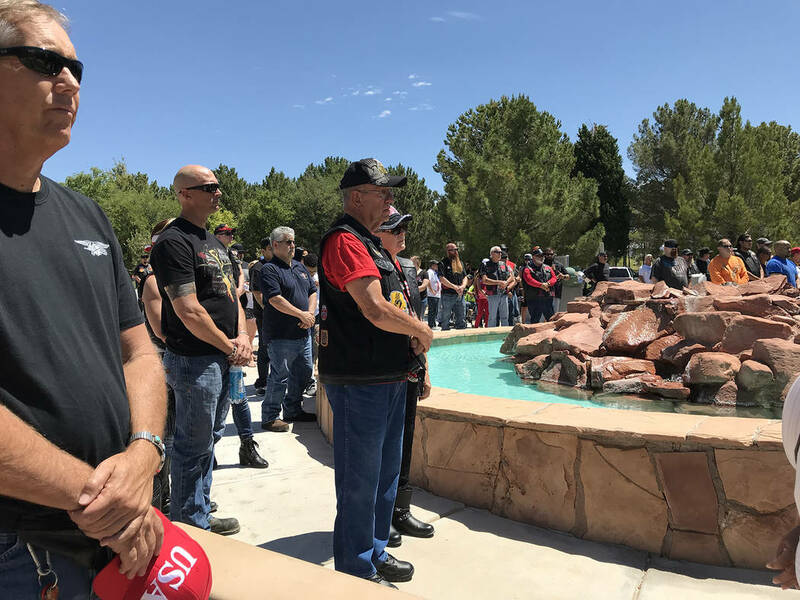 The annual Fly Your Flags Over Hoover Dam run culminated at the cemetery with the Vietnam Vets Legacy Vets Motorcycle Club joined with the Special Forces Association, Chapter 51, of Las Vegas to present a tribute to their fallen brothers. He said the ceremony is a way to “keep the fallen in mind and their families in your heart.” It also is a reminder to celebrate life, live it to the fullest and never give up. Aurelio Flores, president of the Special Forces Association chapter, said the event honors the military’s fallen soldiers, those who have served and those who are still serving. “Fallen But Not Forgotten” was theme of this year’s memorial service. Since last Memorial Day, five Green Berets have been killed, including four that we ambushed in Niger when they were helping train Nigerian security forces. Approximately 60 people attended the program on Monday morning hosted by Boulder City’s American Legion Post 31 at Boulder City Cemetery. “It’s a solemn day, honoring those who have given their lives fighting for us,” said City Councilman Kiernan McManus, who the keynote speaker. He encouraged everyone to remember the bright future given to them by those sacrifices and that Boulder City also looks to its history for its future. 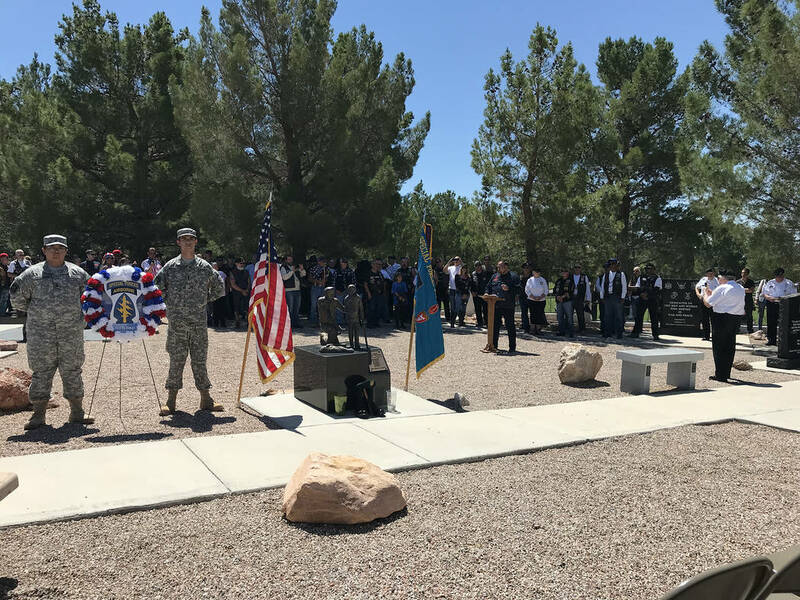 The Nevada Department of Veterans Services hosted a Memorial Day ceremony at the chapel at the Southern Nevada Veterans Memorial Cemetery on Monday afternoon. 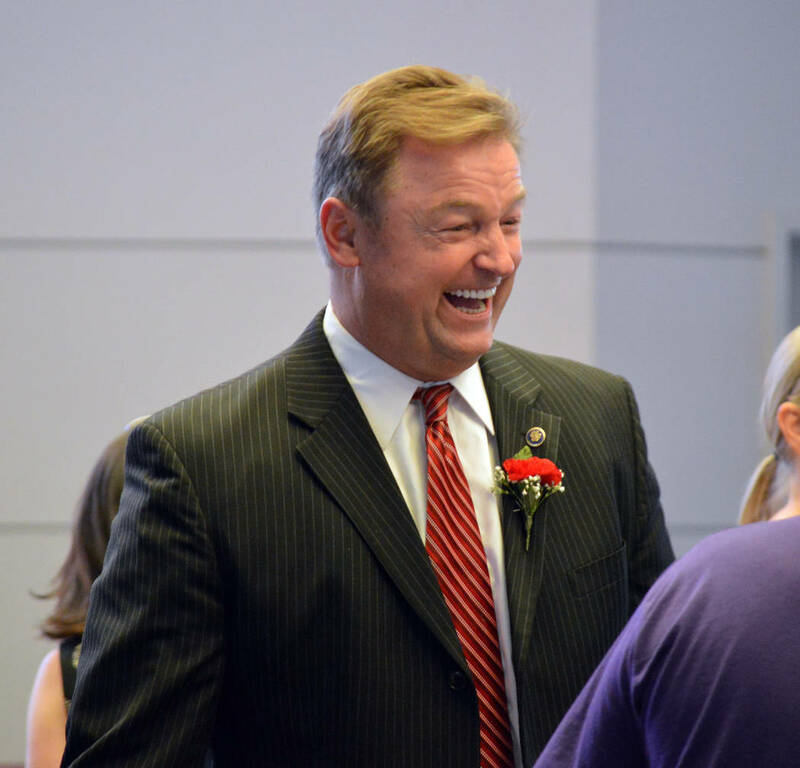 Those in attendance included some of Nevada’s state and national leaders including, U.S. Sens. Dean Heller and Catherine Cortez Masto, U.S. Reps. Jacky Rosen and Ruben Kihuen and Nevada Attorney General Adam Laxalt. Navy Lt. Cmdr. Ed Giron was one of the keynote speakers and spoke about consistencies he found when researching America’s military heroes and that he had experienced in his military career. Those themes included commitment to excellence and integrity in standards. Giron, who is commander of the Naval Operations Support Center in Las Vegas, encouraged everyone to remember the sacrifices those heroes and other veterans made in protecting the country. Additionally, he had some words of advice for those who wanted to go into the military. “To those who want to go into service, the sacrifice is high but the reward for freedom is much higher,” he said. Nevada Department of Veterans Services Director and retired Army Col. Katherine Miller was the other keynote speaker, and she spoke on behalf of Gov. Brian Sandoval. She spoke about recently finding her grandmother’s grave. “I don’t know what I was expecting … what I experienced was very impactful,” she said. Her grandmother died during the Great Depression, and Miller said that she had never met her but felt connected to her when she touched the headstone. On behalf of Sandoval, she encouraged everyone to join with “friends and strangers alike” to remember those were lost and to never forget them. The program also featured musical performances by Phil Esser of Boulder City and the Grand Opera Society of Las Vegas as well as recognition of veterans, residents of the Nevada State Veterans Home in Boulder City, Blue Star Mothers, Gold Star Parents, and the Southern Nevada Veterans Memorial Cemetery Association members and volunteers. The Scottish American Military Society, Post 711, presented the colors, and the Boulder City Veterans Pilot Group did a flyover in the missing man formation.